Download "Chapter 2 Probability Topics SPSS T tests"
1 Chapter 2 Probability Topics SPSS T tests Data file used: gss.sav In the lecture about chapter 2, only the One-Sample T test has been explained. In this handout, we also give the SPSS methods to perform Independent Samples T tests and Paired Samples T tests, for the sake of completeness. You might need these later in the course. How to get there: Analyze Compare s One-Sample T test particular mean. 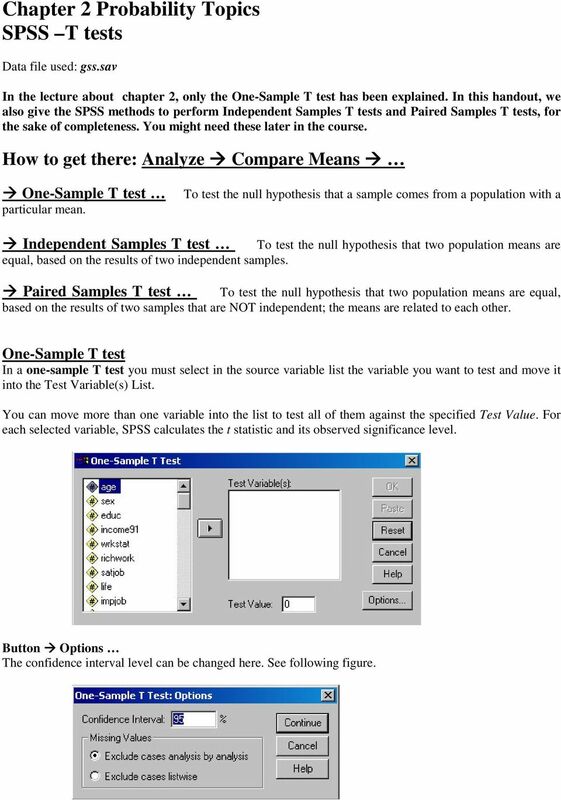 To test the null hypothesis that a sample comes from a population with a Independent Samples T test To test the null hypothesis that two population means are equal, based on the results of two independent samples. 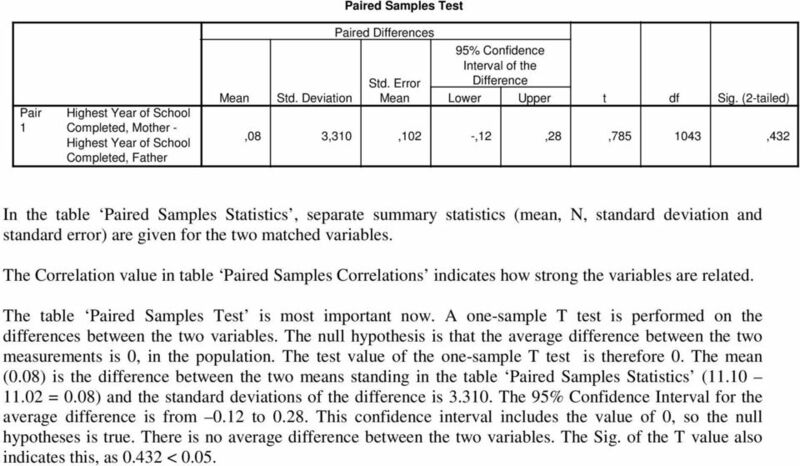 Paired Samples T test To test the null hypothesis that two population means are equal, based on the results of two samples that are NOT independent; the means are related to each other. One-Sample T test In a one-sample T test you must select in the source variable list the variable you want to test and move it into the Test Variable(s) List. You can move more than one variable into the list to test all of them against the specified Test Value. For each selected variable, SPSS calculates the t statistic and its observed significance level. Button Options The confidence interval level can be changed here. See following figure. 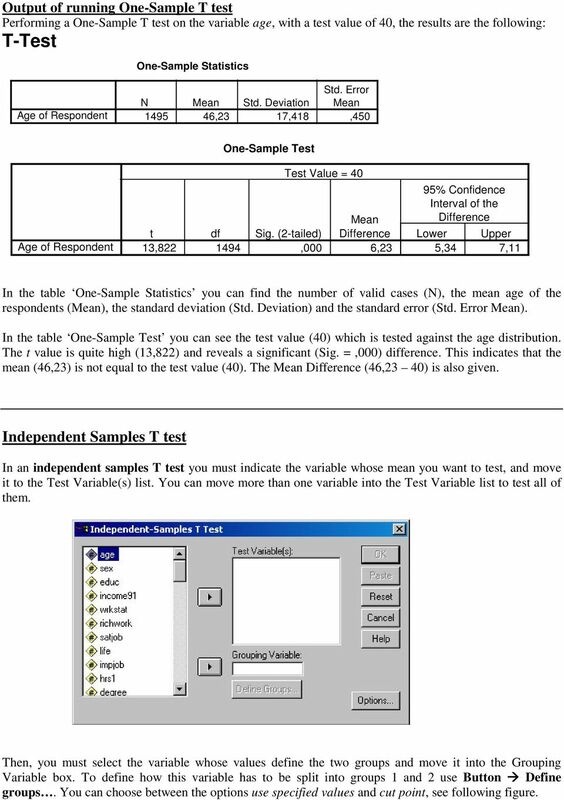 2 Output of running One-Sample T test Performing a One-Sample T test on the variable age, with a test value of 40, the results are the following: One-Sample Statistics N Std. Deviation ,23 7,48,450 One-Sample Test Test Value = 40 Difference t df Sig. (2-tailed) Difference Lower Upper 3, ,000 6,23 5,34 7, In the table One-Sample Statistics you can find the number of valid cases (N), the mean age of the respondents (), the standard deviation (Std. Deviation) and the standard error ( ). In the table One-Sample Test you can see the test value (40) which is tested against the age distribution. The t value is quite high (3,822) and reveals a significant (Sig. =,000) difference. This indicates that the mean (46,23) is not equal to the test value (40). The Difference (46,23 40) is also given. 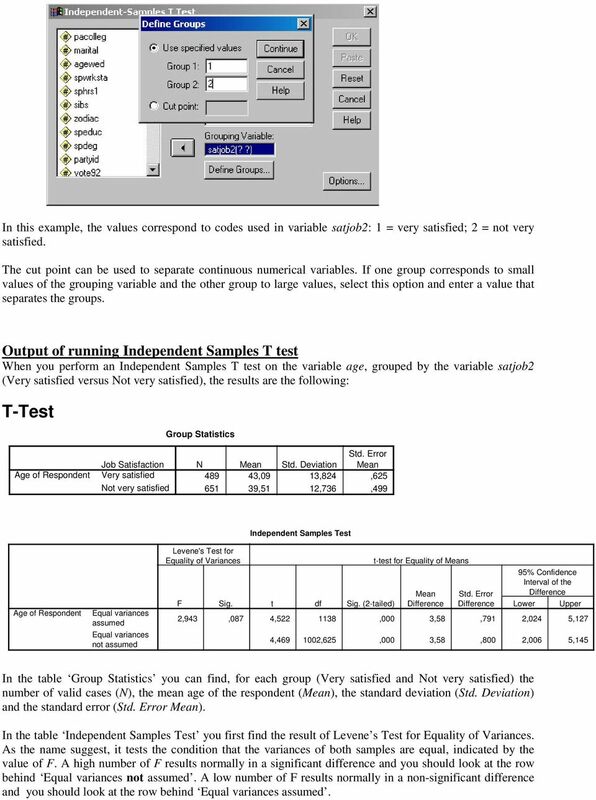 Independent Samples T test In an independent samples T test you must indicate the variable whose mean you want to test, and move it to the Test Variable(s) list. You can move more than one variable into the Test Variable list to test all of them. Then, you must select the variable whose values define the two groups and move it into the Grouping Variable box. To define how this variable has to be split into groups and 2 use Button Define groups. You can choose between the options use specified values and cut point, see following figure. 3 In this example, the values correspond to codes used in variable satjob2: = very satisfied; 2 = not very satisfied. The cut point can be used to separate continuous numerical variables. If one group corresponds to small values of the grouping variable and the other group to large values, select this option and enter a value that separates the groups. Output of running Independent Samples T test When you perform an Independent Samples T test on the variable age, grouped by the variable satjob2 (Very satisfied versus Not very satisfied), the results are the following: Group Statistics Job Satisfaction Very satisfied Not very satisfied N Std. Deviation ,09 3,824, ,5 2,736,499 Independent Samples Test Equal variances assumed Equal variances not assumed Levene's Test for Equality of Variances F Sig. t df Sig. (2-tailed) t-test for Equality of s Difference Difference Difference Lower Upper 2,943,087 4,522 38,000 3,58,79 2,024 5,27 4, ,625,000 3,58,800 2,006 5,45 In the table Group Statistics you can find, for each group (Very satisfied and Not very satisfied) the number of valid cases (N), the mean age of the respondent (), the standard deviation (Std. Deviation) and the standard error ( ). In the table Independent Samples Test you first find the result of Levene s Test for Equality of Variances. As the name suggest, it tests the condition that the variances of both samples are equal, indicated by the value of F. A high number of F results normally in a significant difference and you should look at the row behind Equal variances not assumed. A low number of F results normally in a non-significant difference and you should look at the row behind Equal variances assumed. 5 Pair Completed, Mother - Paired Samples Test Paired Differences Difference Std. Deviation Lower Upper t df Sig. (2-tailed),08 3,30,02 -,2,28, ,432 In the table Paired Samples Statistics, separate summary statistics (mean, N, standard deviation and standard error) are given for the two matched variables. The Correlation value in table Paired Samples Correlations indicates how strong the variables are related. The table Paired Samples Test is most important now. 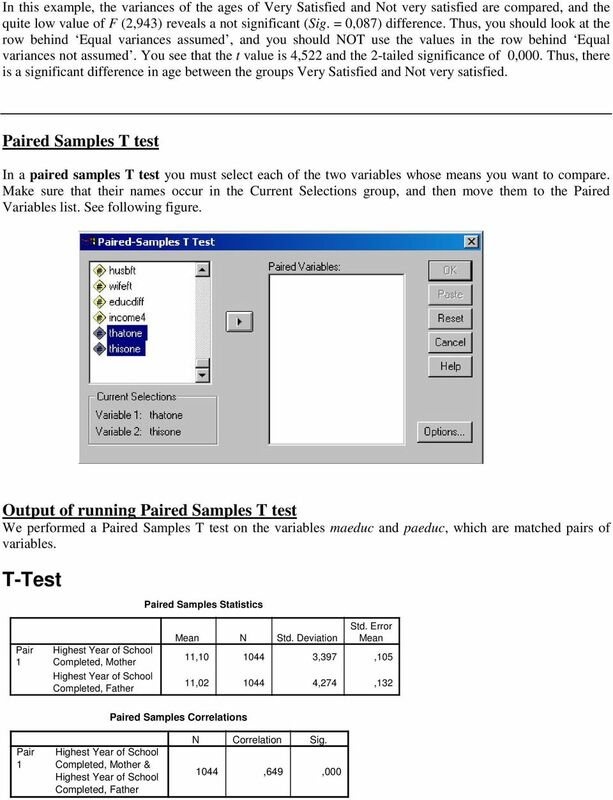 A one-sample T test is performed on the differences between the two variables. The null hypothesis is that the average difference between the two measurements is 0, in the population. The test value of the one-sample T test is therefore 0. The mean (0.08) is the difference between the two means standing in the table Paired Samples Statistics (.0.02 = 0.08) and the standard deviations of the difference is The Interval for the average difference is from 0.2 to This confidence interval includes the value of 0, so the null hypotheses is true. There is no average difference between the two variables. The Sig. of the T value also indicates this, as < 0.05. Analysis of categorical data: Course quiz instructions for SPSS The dataset Please download the Online sales dataset from the Download pod in the Course quiz resources screen. The filename is smr_bus_acd_clo_quiz_online_250.xls. Navigational patterns and shopping cart abandonment behavior. 1. Author.Eric Alkema. 2. Student#...1736280. 3. Supervisor Dr.
Hypothesis Test for Mean Using Given Data (Standard Deviation Known-z-test) A hypothesis test is conducted when trying to find out if a claim is true or not. And if the claim is true, is it significant. A study on impact of RBI decision to deregulate savings account interest rates on the banking industry. An analysis method for a quantitative outcome and two categorical explanatory variables. Lee A. Becker Effect Size (ES) 2000 Lee A. Becker I. Overview II. Effect Size Measures for Two Independent Groups 1. Standardized difference between two groups. A Critical Study of implementation of Cloud Computing in IT & Educational Sectors Dr. Manisha Kumbhar, Mr. Shekhar Gavali, Mr.Ajit Jagdale, Mr. Rohit Sovani, Mr. Lalit Bhokare & Mr. Nagesh Kulkarni Asso. sensr - Part 2 Similarity testing and replicated data (and sensr) p 1 2 p d 1. Analysing similarity test data. General Sir John Kotelawala Defence University Workshop on Descriptive and Inferential Statistics Faculty of Research and Development 14 th May 2013 1. Introduction to Statistics 1.1 What is Statistics? Image of Life Insurance Services An Expectation-Experience Gap Analysis (Customer Cost Dimension).